Maybe it’s not too early. 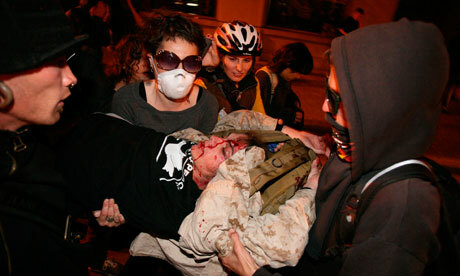 The savage cop attack Tuesday night on Occupy Oakland! has intensified this change in climate, and changed the way the issue is being looked at and debated within the movement itself. Videos of the tear gas and flashbang grenade attack on the encampment plus the skull fracture that put Iraq vet Scott Olsen on the critical list have also changed the calculus of repression for the enemy, but that’s not really what I am talking about here. Direct targeting by the police is only one of three ways the gravitational field generated by the amazing and unexpected Occupy! movement is reshaping the issue of police violence in this country. 1. Most directly, the Occupy movement has posed the most powerful political and symbolic challenge in generations to private property and the day-to-day workings of the capitalist system. Inevitably, this has meant that the paid guardians of that system, the pigs, would be brought to bear to crush that challenge. So far, that has helped build the movement. During one rainy graveyard shift stint at the information table at Liberty Plaza last week I talked to two fulltime occupiers, young white guys. Both said that what got them to the encampment (Brian from semi-rural North Carolina and James from Queens) was the Internet. More specifically, neither had been more than peripherally aware of OWS! before the notorious video clip of NYPD Deputy Inspector Anthony Bologna pepper spraying already penned-up young female protesters went viral. That “Tony Baloney” pepper spray incident was the first big, well-publicized attack on the protests. Scores more have occurred around the country, and the arrests now number in the thousands. Every day’s news brings new reports of police evicting occupiers from parks. The threat of attack hangs over even peaceful, permitted occupations, where those following closely know that mayoral pledges to let us stay have been violated in New York, Oakland, Nashville and other cities. 2. Meanwhile the diverse and largely locally-based movement against police violence and terror has been looking hard at the new opportunities before it. For anti-cop activists, just as for folks from other social movements, like union strike supporters or environmental protesters, the Occupy! movement has become a kind of funnel into which particular struggles are poured. For instance, several of the earliest Occupy! encampments saw participants taking part in protests of the police-union-demanded execution of Troy Davis in Georgia. Occupy Oakland! named their base area Oscar Grant Park after the young Black man murdered by Bay Area Rapid Transit cops on New Year’s Day, 2009. The next day was October 22, the annual National Day of Protest to Stop Police Brutality, Repression and the Criminalization of a Generation. This year’s march was over 800 strong, larger than it has been in recent years, and as militant as always. Folks who came up from Liberty Plaza made up a sizeable minority of the crowd. There before me was the transformation made possible by this teachable moment. Scores among the young occupiers who had come out for the demo rolled through the Lower East Side, hollering “NYPD KKK” and other chants about “pigs”–formulations I suspect might never have crossed their lips, or maybe even their minds a month ago. 3. Forces within the Occupy! movement are consciously using it to deepen the movement’s ties in the 99%, to do outreach in and build ties with communities of color and to educate the more clueless of the white newbies in the movement. Police violence remains, for obvious reasons, a major issue in communities of color, an open wound that can trigger an eruption of local struggle at any time. Many support the sit-in, but some are criticizing it. After all, the police have been very accommodating of Occupy Philly--why provoke them with this action? Don't police officers, who are often overworked and underpaid, belong to the 99%? Most of all, shouldn't we stay focused on corporate greed instead of getting distracted by secondary issues? Among those working to break through this unclarity and resistance are those of us who are revolutionary socialists helping to build OWS! We’ve got a twofold task before us. First is to be a part of the effort to undermine white privilege within the movement. Promoting understanding of how the police operate as an occupying army in oppressed nationality communities is a good tool to do that. Several Occupy! nodes have had useful workshops/meetings in which folks have testified about their own personal experience with cops. With a decent pool of people participating and egos kept in check, it soon becomes clear that a. yep, white folks get vamped on, too, and b. nope, nowhere near as comprehensively as people of color. The other part of the job for reds is to spread a little class analysis. I suggested, in a previous piece about OWS!, that using 99% and 1% as our only categories for determining friends and enemies was not adequate. The question of the police, the bottom line defense of capitalist rule, is probably the biggest single reason why. True enough, cops come from working class and middle class communities. Nor are they paid enough to qualify them for that top 1%. That does not mean they are our friends. The police are not a democratic organization; they are not directed or controlled by the community in any way. The police answer to the city officials, who answer to the politicians, who answer to the wealthy campaign donors who put them in power. A perfect example of this occurred just a few weeks ago (October 1st) when JP Morgan Chase bank gave the NYPD a massive and unprecedented $4.6 million "donation," just days after the mass arrests of protesters at Occupy Wall Street. This is the bankers reminding their NYPD guard dogs who they are truly hired to protect and serve: the interests of the capitalist class. In short, we appear to find ourselves in one of those amazing historical moments when a social tornado shakes the old order. Cracks and fissures suddenly appear in accepted wisdom, revealing glimpses of how things really work. Those who plunge into the whirlwind, especially, are learning more about how the world in weeks than they might in years of ordinary times. Tens of thousands are already learning the kind of lessons that that previous upheavals like the ‘60s have taught. That cannot help but retool and refuel the struggle against police violence in this country. Lets get this in order, the OWS protesters at Oakland attacked the cops with bricks, bottles and other such items. Where in the rules does it say that your not going to get hurt if you start being violent? It is amazing to me how the media and others have ignored the facts just to blame the cops! I don't know where "Anonymous" gathers his or her information. Was this shared by 1%-mouthpiece Fox News? Perhaps some other purveyor of Monopoly Capitalist lies, such as Glenn Beck? In Newark, NJ, where the People's Organization for Progress has sponsored the People's Daily Campaign for Jobs & Justice (our local Occupy! campaign) for more than 125 days, POP is also well know for organizing against police brutality and all state-sponsored terrorism directed at minority communities. In this context, it might help "Anoymous" understand these lies about "demonstrator violence" if I point out that Occupy Oakland has the highest percentage people-of-color participation of any Occupy! protest in the US outside, perhaps, Newark. In this country, the ruling elite (or their media spokespeople) can ALWAYS get away lying about the suppose violence of Black people. By the way Rahm, I do not watch any of the main stream midea types, but it sounds like you might be relying on Jon Stewart. I investigate things, always have. One Key Weakness of Occupy Wall Street! Occupy Wall Street!? I Say It's Like Slime Mold! Damn, Was I Wrong About Occupy Wall Street! The Chinese Left Hails Occupy Wall Street!